If you want to dive into making common graphics as quickly as possible, I recommend The R Graphics Cookbook by Winston Chang. It provides a set of recipes to solve common graphics problems. A 2nd edition is due out in 2018. If you’ve mastered the basics and want to learn more, read ggplot2: Elegant Graphics for Data Analysis. It describes the theoretical underpinnings of ggplot2 and shows you how all the pieces fit together. This book helps you understand the theory that underpins ggplot2, and will help you create new types of graphics specifically tailored to your needs. The book is not available for free, but you can find the complete source for the book at https://github.com/hadley/ggplot2-book. This is a minor release and breaking changes have been kept to a minimum. End users of ggplot2 are unlikely to encounter any issues. However, there are a few items that developers of ggplot2 extensions should be aware of. For additional details, see also the discussion accompanying issue #2890. In non-user-facing internal code (specifically in the aes() function and in the aesthetics argument of scale functions), ggplot2 now always uses the British spelling for aesthetics containing the word "colour". When users specify a "color" aesthetic it is automatically renamed to "colour". This renaming is also applied to non-standard aesthetics that contain the word "color". For example, "point_color" is renamed to "point_colour". This convention makes it easier to support both British and American spelling for novel, non-standard aesthetics, but it may require some adjustment for packages that have previously introduced non-standard color aesthetics using American spelling. A new function standardise_aes_names() is provided in case extension writers need to perform this renaming in their own code (@clauswilke, #2649). Functions that generate other functions (closures) now force the arguments that are used from the generated functions, to avoid hard-to-catch errors. This may affect some users of manual scales (such as scale_colour_manual(), scale_fill_manual(), etc.) who depend on incorrect behavior (@krlmlr, #2807). Coord objects now have a function backtransform_range() that returns the panel range in data coordinates. This change may affect developers of custom coords, who now should implement this function. It may also affect developers of custom geoms that use the range() function. In some applications, backtransform_range() may be more appropriate (@clauswilke, #2821). coord_sf() has much improved customization of axis tick labels. Labels can now be set manually, and there are two new parameters, label_graticule and label_axes, that can be used to specify which graticules to label on which side of the plot (@clauswilke, #2846, #2857, #2881). Two new geoms geom_sf_label() and geom_sf_text() can draw labels and text on sf objects. Under the hood, a new stat_sf_coordinates() calculates the x and y coordinates from the coordinates of the sf geometries. You can customize the calculation method via fun.geometry argument (@yutannihilation, #2761). benchplot() now uses tidy evaluation (@dpseidel, #2699). The error message in compute_aesthetics() now only provides the names of aesthetics with mismatched lengths, rather than all aesthetics (@karawoo, #2853). For faceted plots, data is no longer internally reordered. This makes it safer to feed data columns into aes() or into parameters of geoms or stats. However, doing so remains discouraged (@clauswilke, #2694). coord_sf() now also understands the clip argument, just like the other coords (@clauswilke, #2938). fortify() now displays a more informative error message for grouped_df() objects when dplyr is not installed (@jimhester, #2822). All geom_*() now display an informative error message when required aesthetics are missing (@dpseidel, #2637 and #2706). geom_boxplot() now understands the width parameter even when used with a non-standard stat, such as stat_identity() (@clauswilke, #2893). geom_hex() now understands the size and linetype aesthetics (@mikmart, #2488). geom_hline(), geom_vline(), and geom_abline() now work properly with coord_trans() (@clauswilke, #2149, #2812). geom_text(..., parse = TRUE) now correctly renders the expected number of items instead of silently dropping items that are empty expressions, e.g. the empty string "". If an expression spans multiple lines, we take just the first line and drop the rest. This same issue is also fixed for geom_label() and the axis labels for geom_sf() (@slowkow, #2867). geom_sf() now respects lineend, linejoin, and linemitre parameters for lines and polygons (@alistaire47, #2826). ggsave() now exits without creating a new graphics device if previously none was open (@clauswilke, #2363). labs() now has named arguments title, subtitle, caption, and tag. Also, labs() now accepts tidyeval (@yutannihilation, #2669). position_nudge() is now more robust and nudges only in the direction requested. This enables, for example, the horizontal nudging of boxplots (@clauswilke, #2733). sec_axis() and dup_axis() now return appropriate breaks for the secondary axis when applied to log transformed scales (@dpseidel, #2729). sec_axis() now works as expected when used in combination with tidy eval (@dpseidel, #2788). scale_*_date(), scale_*_time() and scale_*_datetime() can now display a secondary axis that is a one-to-one transformation of the primary axis, implemented using the sec.axis argument to the scale constructor (@dpseidel, #2244). stat_contour(), stat_density2d(), stat_bin2d(), stat_binhex() now calculate normalized statistics including nlevel, ndensity, and ncount. Also, stat_density() now includes the calculated statistic nlevel, an alias for scaled, to better match the syntax of stat_bin() (@bjreisman, #2679). ggplot2 now supports/uses tidy evaluation (as described below). This is a major change and breaks a number of packages; we made this breaking change because it is important to make ggplot2 more programmable, and to be more consistent with the rest of the tidyverse. The best general (and detailed) introduction to tidy evaluation can be found in the meta programming chapters in Advanced R.
The primary developer facing change is that aes() now contains quosures (expression + environment pairs) rather than symbols, and you'll need to take a different approach to extracting the information you need. A common symptom of this change are errors "undefined columns selected" or "invalid 'type' (list) of argument" (#2610). As in the previous version, constants (like aes(x = 1) or aes(colour = "smoothed")) are stored as is. In this version of ggplot2, if you need to describe a mapping in a string, use quo_name() (to generate single-line strings; longer expressions may be abbreviated) or quo_text() (to generate non-abbreviated strings that may span multiple lines). If you do need to extract the value of a variable instead use rlang::eval_tidy(). You may want to condition on (packageVersion("ggplot2") <= "2.2.1") so that your code can work with both released and development versions of ggplot2. We recognise that this is a big change and if you're not already familiar with rlang, there's a lot to learn. If you are stuck, or need any help, please reach out on https://community.rstudio.com. Internally, ggplot2 now uses as.data.frame(tibble::as_tibble(x)) to convert a list into a data frame. This improves ggplot2's support for list-columns (needed for sf support), at a small cost: you can no longer use matrix-columns. Note that unlike tibble we still allow column vectors such as returned by base::scale() because of their widespread use. Previously aes_string(x = c("a", "b", "c")) silently returned aes(x = a). Now this is a clear error. If layer data contains columns with identical names an error will be thrown. In earlier versions the first occuring column was chosen silently, potentially masking that the wrong data was chosen. Layers are stricter about the columns they will combine into a single data frame. Each aesthetic now must be either the same length as the data frame or a single value. This makes silent recycling errors much less likely. Free scales only work with selected coordinate systems; previously you'd get an incorrect plot. This is because the oob argument to scale has been set to a function that only takes a single argument; it needs to take two arguments (x, and range). The function guide_train() now has an optional parameter aesthetic that allows you to override the aesthetic setting in the scale. To make your code work with the both released and development versions of ggplot2 appropriate, add aesthetic = NULL to the guide_train() method signature. Then, inside the function, replace scale$aesthetics, aesthetic %||% scale$aesthetics. (The %||% operator is defined in the rlang package). The long-deprecated subset argument to layer() has been removed. aes() now supports quasiquotation so that you can use ! !, !! !, and :=. This replaces aes_() and aes_string() which are now soft-deprecated (but will remain around for a long time). facet_wrap() and facet_grid() now support vars() inputs. Like dplyr::vars(), this helper quotes its inputs and supports quasiquotation. For instance, you can now supply faceting variables like this: facet_wrap(vars(am, cyl)) instead of facet_wrap(~am + cyl). Note that the formula interface is not going away and will not be deprecated. vars() is simply meant to make it easier to create functions around facet_wrap() and facet_grid(). The first two arguments of facet_grid() become rows and cols and now support vars() inputs. Note however that we took special care to ensure complete backward compatibility. With this change facet_grid(vars(cyl), vars(am, vs)) is equivalent to facet_grid(cyl ~ am + vs), and facet_grid(cols = vars(am, vs)) is equivalent to facet_grid(. ~ am + vs). One nice aspect of the new interface is that you can now easily supply names: facet_grid(vars(Cylinder = cyl), labeller = label_both) will give nice label titles to the facets. Of course, those names can be unquoted with the usual tidy eval syntax. It supports all simple features, automatically aligns CRS across layers, sets up the correct aspect ratio, and draws a graticule. 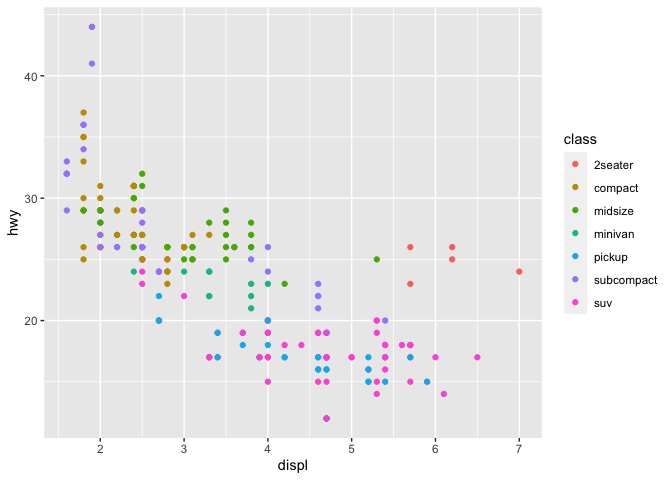 ggplot2 now works on R 3.1 onwards, and uses the vdiffr package for visual testing. In most cases, accidentally using %>% instead of + will generate an informative error (#2400). New syntax for calculated aesthetics. Instead of using aes(y = ..count..) you can (and should!) use aes(y = stat(count)). stat() is a real function with documentation which hopefully will make this part of ggplot2 less confusing (#2059). New tag label for adding identification tags to plots, typically used for labelling a subplot with a letter. Add a tag with labs(tag = "A"), style it with the plot.tag theme element, and control position with the plot.tag.position theme setting (@thomasp85). geom_segment() and geom_curve() have a new arrow.fill parameter which allows you to specify a separate fill colour for closed arrowheads (@hrbrmstr and @clauswilke, #2375). geom_point() and friends can now take shapes as strings instead of integers, e.g. geom_point(shape = "diamond") (@daniel-barnett, #2075). position_dodge() gains a preserve argument that allows you to control whether the total width at each x value is preserved (the current default), or ensure that the width of a single element is preserved (what many people want) (#1935). to determine which elements overlap, and spreads overlapping elements evenly within the region of overlap. position_dodge2() is now the default position adjustment for geom_boxplot(), because it handles varwidth = TRUE, and will be considered for other geoms in the future. The padding parameter adds a small amount of padding between elements (@karawoo, #2143) and a reverse parameter allows you to reverse the order of placement (@karawoo, #2171). New stat_qq_line() makes it easy to add a simple line to a Q-Q plot, which makes it easier to judge the fit of the theoretical distribution (@nicksolomon). Improved support for mapping date/time variables to alpha, size, colour, and fill aesthetics, including date_breaks and date_labels arguments (@karawoo, #1526), and new scale_alpha() variants (@karawoo, #1526). Improved support for ordered factors. Ordered factors throw a warning when mapped to shape (unordered factors do not), and do not throw warnings when mapped to size or alpha (unordered factors do). Viridis is used as the default colour and fill scale for ordered factors (@karawoo, #1526). The expand argument of scale_*_continuous() and scale_*_discrete() now accepts separate expansion values for the lower and upper range limits. The expansion limits can be specified using the convenience function expand_scale(). It can also be useful for line charts, e.g. for counts over time, where one wants to have a ’hard’ lower limit of y = 0 but leave the upper limit unspecified (and perhaps differing between panels), with some extra space above the highest point on the line (with symmetrical limits, the extra space above the highest point could in some cases cause the lower limit to be negative). The old syntax for the expand argument will, of course, continue to work (@huftis, #1669). scale_colour_continuous() and scale_colour_gradient() are now controlled by global options ggplot2.continuous.colour and ggplot2.continuous.fill. These can be set to "gradient" (the default) or "viridis" (@karawoo). New scale_colour_viridis_c()/scale_fill_viridis_c() (continuous) and scale_colour_viridis_d()/scale_fill_viridis_d() (discrete) make it easy to use Viridis colour scales (@karawoo, #1526). Guides for geom_text() now accept custom labels with guide_legend(override.aes = list(label = "foo")) (@brianwdavis, #2458). Strips gain margins on all sides by default. This means that to fully justify text to the edge of a strip, you will need to also set the margins to 0 (@karawoo). Rotated strip labels now correctly understand hjust and vjust parameters at all angles (@karawoo). Strip labels now understand justification relative to the direction of the text, meaning that in y facets, the strip text can be placed at either end of the strip using hjust (@karawoo). Legend titles and labels get a little extra space around them, which prevents legend titles from overlapping the legend at large font sizes (@karawoo, #1881). New autolayer() S3 generic (@mitchelloharawild, #1974). This is similar to autoplot() but produces layers rather than complete plots. Custom objects can now be added using + if a ggplot_add method has been defined for the class of the object (@thomasp85). Theme elements can now be subclassed. Add a merge_element method to control how properties are inherited from the parent element. Add an element_grob method to define how elements are rendered into grobs (@thomasp85, #1981). Coords have gained new extension mechanisms. If you have an existing coord extension, you will need to revise the specification of the train() method. It is now called setup_panel_params() (better reflecting what it actually does) and now has arguments scale_x, and scale_y (the x and y scales respectively) and param, a list of plot specific parameters generated by setup_params(). What was formerly called scale_details (in coords), panel_ranges (in layout) and panel_scales (in geoms) are now consistently called panel_params (#1311). These are parameters of the coord that vary from panel to panel. ggplot_build() and ggplot_gtable() are now generics, so ggplot-subclasses can define additional behavior during the build stage. guide_train(), guide_merge(), guide_geom(), and guide_gengrob() are now exported as they are needed if you want to design your own guide. They are not currently documented; use at your own risk (#2528). scale_type() generic is now exported and documented. Use this if you want to extend ggplot2 to work with a new type of vector. facet_grid() gives a more informative error message if you try to use a variable in both rows and cols (#1928). facet_grid() and facet_wrap() both give better error messages if you attempt to use an unsupported coord with free scales (#2049). label_parsed() works once again (#2279). You can now style the background of horizontal and vertical strips independently with strip.background.x and strip.background.y theme settings (#2249). discrete_scale() documentation now inherits shared definitions from continuous_scale() (@alistaire47, #2052). guide_colorbar() shows all colours of the scale (@has2k1, #2343). scale_identity() once again produces legends by default (#2112). Tick marks for secondary axes with strong transformations are more accurately placed (@thomasp85, #1992). Missing line types now reliably generate missing lines (with standard warning) (#2206). Legends now ignore set aesthetics that are not length one (#1932). All colour and fill scales now have an aesthetics argument that can be used to set the aesthetic(s) the scale works with. This makes it possible to apply a colour scale to both colour and fill aesthetics at the same time, via aesthetics = c("colour", "fill") (@clauswilke). Three new generic scales work with any aesthetic or set of aesthetics: scale_continuous_identity(), scale_discrete_identity(), and scale_discrete_manual() (@clauswilke). scale_*_gradient2() now consistently omits points outside limits by rescaling after the limits are enforced (@foo-bar-baz-qux, #2230). geom_label() now correctly produces unbordered labels when label.size is 0, even when saving to PDF (@bfgray3, #2407). layer() gives considerably better error messages for incorrectly specified geom, stat, or position (#2401). In all layers that use it, linemitre now defaults to 10 (instead of 1) to better match base R.
geom_boxplot() now supplies a default value if no x aesthetic is present (@foo-bar-baz-qux, #2110). geom_density() drops groups with fewer than two data points and throws a warning. For groups with two data points, density values are now calculated with stats::density (@karawoo, #2127). geom_segment() now also takes a linejoin parameter. This allows more control over the appearance of the segments, which is especially useful for plotting thick arrows (@Ax3man, #774). geom_smooth() now reports the formula used when method = "auto" (@davharris #1951). geom_smooth() now orders by the x aesthetic, making it easier to pass pre-computed values without manual ordering (@izahn, #2028). It also now knows it has ymin and ymax aesthetics (#1939). The legend correctly reflects the status of the se argument when used with stats other than the default (@clauswilke, #1546). geom_tile() now once again interprets width and height correctly (@malcolmbarrett, #2510). position_jitter() and position_jitterdodge() gain a seed argument that allows the specification of a random seed for reproducible jittering (@krlmlr, #1996 and @slowkow, #2445). stat_density() has better behaviour if all groups are dropped because they are too small (#2282). stat_summary_bin() now understands the breaks parameter (@karawoo, #2214). stat_bin() now accepts functions for binwidth. This allows better binning when faceting along variables with different ranges (@botanize). stat_bin() and geom_histogram() now sum correctly when using the weight aesthetic (@jiho, #1921). stat_bin() again uses correct scaling for the computed variable ndensity (@timgoodman, #2324). stat_bin() and stat_bin_2d() now properly handle the breaks parameter when the scales are transformed (@has2k1, #2366). update_geom_defaults() and update_stat_defaults() allow American spelling of aesthetic parameters (@foo-bar-baz-qux, #2299). The show.legend parameter now accepts a named logical vector to hide/show only some aesthetics in the legend (@tutuchan, #1798). Layers now silently ignore unknown aesthetics with value NULL (#1909). Clipping to the plot panel is now configurable, through a clip argument to coordinate systems, e.g. coord_cartesian(clip = "off") (@clauswilke, #2536). Like scales, coordinate systems now give you a message when you're replacing an existing coordinate system (#2264). coord_polar() now draws secondary axis ticks and labels (@dylan-stark, #2072), and can draw the radius axis on the right (@thomasp85, #2005). coord_trans() now generates a warning when a transformation generates non-finite values (@foo-bar-baz-qux, #2147). Complete themes now always override all elements of the default theme (@has2k1, #2058, #2079). Themes now set default grid colour in panel.grid rather than individually in panel.grid.major and panel.grid.minor individually. This makes it slightly easier to customise the theme (#2352). Fixed bug when setting strips to element_blank() (@thomasp85). Axes positioned on the top and to the right can now customize their ticks and lines separately (@thomasp85, #1899). Built-in themes gain parameters base_line_size and base_rect_size which control the default sizes of line and rectangle elements (@karawoo, #2176). Default themes use rel() to set line widths (@baptiste). Themes were tweaked for visual consistency and more graceful behavior when changing the base font size. All absolute heights or widths were replaced with heights or widths that are proportional to the base font size. One relative font size was eliminated (@clauswilke). The height of descenders is now calculated solely on font metrics and doesn't change with the specific letters in the string. This fixes minor alignment issues with plot titles, subtitles, and legend titles (#2288, @clauswilke). guide_colorbar() is more configurable: tick marks and color bar frame can now by styled with arguments ticks.colour, ticks.linewidth, frame.colour, frame.linewidth, and frame.linetype (@clauswilke). guide_colorbar() now uses legend.spacing.x and legend.spacing.y correctly, and it can handle multi-line titles. Minor tweaks were made to guide_legend() to make sure the two legend functions behave as similarly as possible (@clauswilke, #2397 and #2398). The theme elements legend.title and legend.text now respect the settings of margin, hjust, and vjust (@clauswilke, #2465, #1502). Non-angle parameters of label.theme or title.theme can now be set in guide_legend() and guide_colorbar() (@clauswilke, #2544). fortify() gains a method for tbls (@karawoo, #2218). ggplot gains a method for grouped_dfs that adds a .group variable, which computes a unique value for each group. Use it with aes(group = .group) (#2351). ggproto() produces objects with class c("ggproto", "gg"), allowing for a more informative error message when adding layers, scales, or other ggproto objects (@jrnold, #2056). ggsave()'s DPI argument now supports 3 string options: "retina" (320 DPI), "print" (300 DPI), and "screen" (72 DPI) (@foo-bar-baz-qux, #2156). ggsave() now uses full argument names to avoid partial match warnings (#2355), and correctly restores the previous graphics device when several graphics devices are open (#2363). print.ggplot() now returns the original ggplot object, instead of the output from ggplot_build(). Also, the object returned from ggplot_build() now has the class "ggplot_built" (#2034). map_data() now works even when purrr is loaded (tidyverse#66). New functions summarise_layout(), summarise_coord(), and summarise_layers() summarise the layout, coordinate systems, and layers of a built ggplot object (#2034, @wch). This provides a tested API that (e.g.) shiny can depend on. Updated startup messages reflect new resources (#2410, @mine-cetinkaya-rundel). Fix usage of structure(NULL) for R-devel compatibility (#1968). Thanks to @hrbrmstr plots now have subtitles and captions, which can be set with the subtitle and caption arguments to ggtitle() and labs(). You can control their appearance with the theme settings plot.caption and plot.subtitle. The main plot title is now left-aligned to better work better with a subtitle. The caption is right-aligned (@hrbrmstr). position_stack() and position_fill() now sort the stacking order to match grouping order. This allows you to control the order through grouping, and ensures that the default legend matches the plot (#1552, #1593). If you want the opposite order (useful if you have horizontal bars and horizontal legend), you can request reverse stacking by using position = position_stack(reverse = TRUE) (#1837). position_stack() and position_fill() now accepts negative values which will create stacks extending below the x-axis (#1691). position_stack() and position_fill() gain a vjust argument which makes it easy to (e.g.) display labels in the middle of stacked bars (#1821). geom_col() was added to complement geom_bar() (@hrbrmstr). It uses stat="identity" by default, making the y aesthetic mandatory. It does not support any other stat_() and does not provide fallback support for the binwidth parameter. Examples and references in other functions were updated to demonstrate geom_col() usage. When creating a layer, ggplot2 will warn if you use an unknown aesthetic or an unknown parameter. Compared to the previous version, this is stricter for aesthetics (previously there was no message), and less strict for parameters (previously this threw an error) (#1585). The facet system, as well as the internal panel class, has been rewritten in ggproto. Facets are now extendable in the same manner as geoms and stats, as described in vignette("extending-ggplot2"). We have also added the following new fatures. facet_grid() and facet_wrap() now allow expressions in their faceting formulas (@DanRuderman, #1596). Strips can now be freely positioned in facet_wrap() using the strip.position argument (deprecates switch). The relative order of panel, strip, and axis can now be controlled with the theme setting strip.placement that takes either inside (strip between panel and axis) or outside (strip after axis). The theme option panel.margin has been deprecated in favour of panel.spacing to more clearly communicate intent. Unfortunately there was a major oversight in the construction of ggproto which lead to extensions capturing the super object at package build time, instead of at package run time (#1826). This problem has been fixed, but requires re-installation of all extension packages. The position of x and y axes can now be changed using the position argument in scale_x_*and scale_y_* which can take top and bottom, and left and right respectively. The themes of top and right axes can be modified using the .top and .right modifiers to axis.text. * and axis.title.*. scale_x_continuous() and scale_y_continuous() can now display a secondary axis that is a one-to-one transformation of the primary axis (e.g. degrees Celcius to degrees Fahrenheit). The secondary axis will be positioned opposite to the primary axis and can be controlled with the sec.axis argument to the scale constructor. Scales worry less about having breaks. If no breaks can be computed, the plot will work instead of throwing an uninformative error (#791). This is particularly helpful when you have facets with free scales, and not all panels contain data. Scales now warn when transformation introduces infinite values (#1696). scale_*_datetime() now supports time zones. It will use the timezone attached to the varaible by default, but can be overridden with the timezone argument. New scale_x_time() and scale_y_time() generate reasonable default breaks and labels for hms vectors (#1752). The treatment of missing values by discrete scales has been thoroughly overhauled (#1584). The underlying principle is that we can naturally represent missing values on discrete variables (by treating just like another level), so by default we should. If present, NAs are shown in discete legends. All discrete scales gain a na.translate argument that allows you to control whether NAs are translated to something that can be visualised, or should be left as missing. Note that if you don't translate (i.e. na.translate = FALSE) the missing values will passed on to the layer, which will warning that it's dropping missing values. To suppress the warnings, you'll also need to add na.rm = TRUE to the layer call. Correctly use scale expansion factors. Don't preserve space for dropped levels (#1638). Only issue one warning when when asking for too many levels (#1674). Unicode labels work better on Windows (#1827). The theme() constructor now has named arguments rather than ellipses. This should make autocomplete substantially more useful. The documentation (including examples) has been considerably improved. When computing the height of titles, ggplot2 now includes the height of the descenders (i.e. the bits of g and y that hang beneath the baseline). This improves the margins around titles, particularly the y axis label (#1712). I have also very slightly increased the inner margins of axis titles, and removed the outer margins. Horizontal legends (i.e. legends on the top or bottom) are horizontally aligned by default (#1842). Use legend.box = "vertical" to switch back to the previous behaviour. legend.justification now controls appearance will plotting the legend outside of the plot area. For example, you can use theme(legend.justification = "top") to make the legend align with the top of the plot. legend.margin now controls margin around individual legends. New legend.box.background, legend.box.spacing, and legend.box.margin control the background, spacing, and margin of the legend box (the region that contains all legends). ggplot2 now imports tibble. This ensures that all built-in datasets print compactly even if you haven't explicitly loaded tibble or dplyr (#1677). Class of aesthetic mapping is preserved when adding aes() objects (#1624). +.gg now works for lists that include data frames. geom_*(show.legend = FALSE) now works for guide_colorbar. geom_boxplot() gains new outlier.alpha (@jonathan-g) and outlier.fill (@schloerke, #1787) parameters to control the alpha/fill of outlier points independently of the alpha of the boxes. position_jitter() (and hence geom_jitter()) now correctly computes the jitter width/jitter when supplied by the user (#1775, @has2k1). geom_contour() more clearly describes what inputs it needs (#1577). geom_curve() respects the lineend paramater (#1852). geom_histogram() and stat_bin() understand the breaks parameter once more. (#1665). The floating point adjustment for histogram bins is now actually used - it was previously inadvertently ignored (#1651). geom_violin() no longer transforms quantile lines with the alpha aesthetic (@mnbram, #1714). It no longer errors when quantiles are requested but data have zero range (#1687). When trim = FALSE it once again has a nice range that allows the density to reach zero (by extending the range 3 bandwidths to either side of the data) (#1700). geom_dotplot() works better when faceting and binning on the y-axis. (#1618, @has2k1). geom_hexbin() once again supports ..density.. (@mikebirdgeneau, #1688). geom_step() gives useful warning if only one data point in layer (#1645). layer() gains new check.aes and check.param arguments. These allow geom/stat authors to optional suppress checks for known aesthetics/parameters. Currently this is used only in geom_blank() which powers expand_limits() (#1795). All stat_*() display a better error message when required aesthetics are missing. stat_ecdf() respects pad argument (#1646). stat_smooth() once again informs you about the method it has chosen. It also correctly calculates the size of the largest group within facets. x and y scales are now symmetric regarding the list of aesthetics they accept: xmin_final, xmax_final, xlower, xmiddle and xupper are now valid x aesthetics. Scale extensions can now override the make_title and make_sec_title methods to let the scale modify the axis/legend titles. The random stream is now reset after calling .onAttach() (#2409). When mapping an aesthetic to a constant (e.g. geom_smooth(aes(colour = "loess")))), the default guide title is the name of the aesthetic (i.e. "colour"), not the value (i.e. "loess") (#1431). layer() now accepts a function as the data argument. The function will be applied to the data passed to the ggplot() function and must return a data.frame (#1527, @thomasp85). This is a more general version of the deprecated subset argument. theme_update() now uses the + operator instead of %+replace%, so that unspecified values will no longer be NULLed out. theme_replace() preserves the old behaviour if desired (@oneillkza, #1519). Better arguments and a better algorithm for determining the origin. You can now specify either boundary or the center of a bin. origin has been deprecated in favour of these arguments. drop is deprecated in favour of pad, which adds extra 0-count bins at either end (needed for frequency polygons). geom_histogram() defaults to pad = FALSE which considerably improves the default limits for the histogram, especially when the bins are big (#1477). The default algorithm does a (somewhat) better job at picking nice widths and origins across a wider range of input data. bins = n now gives a histogram with n bins, not n + 1 (#1487). All geom_() and stat_() functions now have consistent argument order: data + mapping, then geom/stat/position, then ..., then specific arguments, then arguments common to all layers (#1305). This may break code if you were previously relying on partial name matching, but in the long-term should make ggplot2 easier to use. In particular, you can now set the n parameter in geom_density2d() without it partially matching na.rm (#1485). For geoms with both colour and fill, alpha once again only affects fill (Reverts #1371, #1523). This was causing problems for people. facet_wrap()/facet_grid() works with multiple empty panels of data (#1445). facet_wrap() correctly swaps nrow and ncol when faceting vertically (#1417). ggsave("x.svg") now uses svglite to produce the svg (#1432). geom_boxplot() now understands outlier.color (#1455). geom_path() knows that "solid" (not just 1) represents a solid line (#1534). geom_ribbon() preserves missing values so they correctly generate a gap in the ribbon (#1549). geom_tile() once again accepts width and height parameters (#1513). It uses draw_key_polygon() for better a legend, including a coloured outline (#1484). layer() now automatically adds a na.rm parameter if none is explicitly supplied. position = "nudge" now works (although it doesn't do anything useful) (#1428). The default scale for columns of class "AsIs" is now "identity" (#1518). scale_*_discrete() has better defaults when used with purely continuous data (#1542). scale_size() warns when used with categorical data. scale_size(), scale_colour(), and scale_fill() gain date and date-time variants (#1526). stat_bin_hex() and stat_bin_summary() now use the same underlying algorithm so results are consistent (#1383). stat_bin_hex() now accepts a weight aesthetic. To be consistent with related stats, the output variable from stat_bin_hex() is now value instead of count. stat-density-2d() no longer ignores the h parameter, and now accepts bins and binwidth parameters to control the number of contours (#1448, @has2k1). stat_ecdf() does a better job of adding padding to -Inf/Inf, and gains an argument pad to suppress the padding if not needed (#1467). stat_function() gains an xlim parameter (#1528). It once again works with discrete x values (#1509). stat_summary() preserves sorted x order which avoids artefacts when display results with geom_smooth() (#1520). theme_void() was completely void of text but facets and legends still need labels. They are now visible (@jiho). You can once again set legend key and height width to unit arithmetic objects (like 2 * unit(1, "cm")) (#1437). Eliminate spurious warning if you have a layer with no data and no aesthetics (#1451). ggplot no longer throws an error if your plot has no layers. Instead it automatically adds geom_blank() (#1246). New cut_width() is a convenient replacement for the verbose plyr::round_any(), with the additional benefit of offering finer control. New geom_count() is a convenient alias to stat_sum(). Use it when you have overlapping points on a scatterplot. stat_sum() now defaults to using counts instead of proportions. New geom_curve() adds curved lines, with a similar specification to geom_segment() (@veraanadi, #1088). Date and datetime scales now have date_breaks, date_minor_breaks and date_labels arguments so that you never need to use the long scales::date_breaks() or scales::date_format(). geom_bar() now has it's own stat, distinct from stat_bin() which was also used by geom_histogram(). geom_bar() now uses stat_count() which counts values at each distinct value of x (i.e. it does not bin the data first). This can be useful when you want to show exactly which values are used in a continuous variable. New position_nudge() allows you to slightly offset labels (or other geoms) from their corresponding points (#1109). scale_size() now maps values to area, not radius. Use scale_radius() if you want the old behaviour (not recommended, except perhaps for lines). New stat_summary_bin() works like stat_summary() but on binned data. It's a generalisation of stat_bin() that can compute any aggregate, not just counts (#1274). Both default to mean_se() if no aggregation functions are supplied (#1386). Layers are now much stricter about their arguments - you will get an error if you've supplied an argument that isn't an aesthetic or a parameter. This is likely to cause some short-term pain but in the long-term it will make it much easier to spot spelling mistakes and other errors (#1293). This change does break a handful of geoms/stats that used ... to pass additional arguments on to the underlying computation. Now geom_smooth()/stat_smooth() and geom_quantile()/stat_quantile() use method.args instead (#1245, #1289); and stat_summary() (#1242), stat_summary_hex(), and stat_summary2d() use fun.args. There is now an official mechanism for defining Stats, Geoms, and Positions in other packages. See vignette("extending-ggplot2") for details. All Geoms, Stats and Positions are now exported, so you can inherit from them when making your own objects (#989). ggplot2 no longer uses proto or reference classes. Instead, we now use ggproto, a new OO system designed specifically for ggplot2. Unlike proto and RC, ggproto supports clean cross-package inheritance. Creating a new OO system isn't usually the right way to solve a problem, but I'm pretty sure it was necessary here. Read more about it in the vignette. aes_() replaces aes_q(). It also supports formulas, so the most concise SE version of aes(carat, price) is now aes_(~carat, ~price). You may want to use this form in packages, as it will avoid spurious R CMD check warnings about undefined global variables. nudge_x and nudge_y arguments let you offset labels from their corresponding points (#1120). check_overlap = TRUE provides a simple way to avoid overplotting of labels: labels that would otherwise overlap are omitted (#1039). hjust and vjust can now be character vectors: "left", "center", "right", "bottom", "middle", "top". New options include "inward" and "outward" which align text towards and away from the center of the plot respectively. geom_label() works like geom_text() but draws a rounded rectangle underneath each label (#1039). This is useful when you want to label plots that are dense with data. The little used aes_auto() has been deprecated. aes_q() has been replaced with aes_() to be consistent with SE versions of NSE functions in other packages. The stat and position arguments to qplot() have been deprecated. qplot() is designed for quick plots - if you need to specify position or stat, use ggplot() instead. The theme setting axis.ticks.margin has been deprecated: now use the margin property of axis.text. stat_abline(), stat_hline() and stat_vline() have been removed: these were never suitable for use other than with geom_abline() etc and were not documented. stat_binhex() and stat_bin2d() have been renamed to stat_bin_hex() and stat_bin_2d() (#1274). stat_summary2d() has been renamed to stat_summary_2d(), geom_density2d()/stat_density2d() has been renamed to geom_density_2d()/stat_density_2d(). stat_spoke() is now geom_spoke() since I realised it's a reparameterisation of `geom_segment(). stat_bindot() has been removed because it's so tightly coupled to geom_dotplot(). If you happened to use stat_bindot(), just change to geom_dotplot() (#1194). The default theme_grey() background colour has been changed from "grey90" to "grey92": this makes the background a little less visually prominent. Legend and axis titles are given the same visual treatment. The default font size dropped from 12 to 11. You might be surprised that I've made the default text size smaller as it was already hard for many people to read. It turns out there was a bug in RStudio (fixed in 0.99.724), that shrunk the text of all grid based graphics. Once that was resolved the defaults seemed too big to my eyes. More spacing between titles and borders. Default margins scale with the theme font size, so the appearance at larger font sizes should be considerably improved (#1228). alpha now affects both fill and colour aesthetics (#1371). element_text() gains a margins argument which allows you to add additional padding around text elements. To help see what's going on use debug = TRUE to display the text region and anchors. The default font size in geom_text() has been decreased from 5mm (14 pts) to 3.8 mm (11 pts) to match the new default theme sizes. A diagonal line is no longer drawn on bar and rectangle legends. Instead, the border has been tweaked to be more visible, and more closely match the size of line drawn on the plot. geom_pointrange() and geom_linerange() get vertical (not horizontal) lines in the legend (#1389). The default line size for geom_smooth() has been increased from 0.5 to 1 to make it easier to see when overlaid on data. geom_bar() and geom_rect() use a slightly paler shade of grey so they aren't so visually heavy. geom_boxplot() now colours outliers the same way as the boxes. Sizes in ggplot2 are measured in mm. Previously they were converted to pts (for use in grid) by multiplying by 72 / 25.4. However, grid uses printer's points, not Adobe (big pts), so sizes are now correctly multiplied by 72.27 / 25.4. This is unlikely to noticeably affect display, but it's technically correct (https://youtu.be/hou0lU8WMgo). New theme_void() is completely empty. It's useful for plots with non- standard coordinates or for drawings (@jiho, #976). New theme setting panel.ontop (logical) make it possible to place background elements (i.e., gridlines) on top of data. Best used with transparent panel.background (@noamross. #551). facet_wrap() gains a labeller option (#25). facet_grid() and facet_wrap() gain a switch argument to display the facet titles near the axes. When switched, the labels become axes subtitles. switch can be set to "x", "y" or "both" (the latter only for grids) to control which margin is switched. They now offer the multi_line argument to control whether to display composite facets (those specified as ~var1 + var2) on one or multiple lines. In label_bquote() you now refer directly to the names of variables. With this change, you can create math expressions that depend on more than one variable. This math expression can be specified either for the rows or the columns and you can also provide different expressions to each margin. As a consequence of these changes, referring to x in backquoted expressions is deprecated. Similarly to label_bquote(), labeller() now take .rows and .cols arguments. In addition, it also takes .default. labeller() is useful to customise how particular variables are labelled. The three additional arguments specify how to label the variables are not specifically mentioned, respectively for rows, columns or both. This makes it especially easy to set up a project-wide labeller dispatcher that can be reused across all your plots. See the documentation for an example. The new labeller label_context() adapts to the number of factors facetted over. With a single factor, it displays only the values, just as before. But with multiple factors in a composite margin (e.g. with ~cyl + am), the labels are passed over to label_both(). This way the variables names are displayed with the values to help identifying them. On the programming side, the labeller API has been rewritten in order to offer more control when faceting over multiple factors (e.g. with formulae such as ~cyl + am). This also means that if you have written custom labellers, you will need to update them for this version of ggplot. Previously, a labeller function would take variable and value arguments and return a character vector. Now, they take a data frame of character vectors and return a list. The input data frame has one column per factor facetted over and each column in the returned list becomes one line in the strip label. See documentation for more details. The labels received by a labeller now contain metadata: their margin (in the "type" attribute) and whether they come from a wrap or a grid facet (in the "facet" attribute). Note that the new as_labeller() function operator provides an easy way to transform an existing function to a labeller function. The existing function just needs to take and return a character vector. Improved documentation for aes(), layer() and much much more. geom_smooth() gains explicit method, se and formula arguments. geom_histogram() gains binwidth, bins, originandright` arguments. Use of qplot() in examples has been minimised (#1123, @hrbrmstr). This is inline with the 2nd edition of the ggplot2 box, which minimises the use of qplot() in favour of ggplot(). Tighly linked geoms and stats (e.g. geom_boxplot() and stat_boxplot()) are now documented in the same file so you can see all the arguments in one place. Variations of the same idea (e.g. geom_path(), geom_line(), and geom_step()) are also documented together. It's now obvious that you can set the binwidth parameter for stat_bin_hex(), stat_summary_hex(), stat_bin_2d(), and stat_summary_2d(). The internals of positions have been cleaned up considerably. You're unlikely to notice any external changes, although the documentation should be a little less confusing since positions now don't list parameters they never use. All datasets have class tbl_df so if you also use dplyr, you get a better print method. economics has been brought up to date to 2015-04-01. New economics_long is the economics data in long form. New txhousing dataset containing information about the Texas housing market. Useful for examples that need multiple time series, and for demonstrating model+vis methods. New luv_colours dataset which contains the locations of all built-in colors() in Luv space. movies has been moved into its own package, ggplot2movies, because it was large and not terribly useful. If you've used the movies dataset, you'll now need to explicitly load the package with library(ggplot2movies). All partially matched arguments and $ have been been replaced with full matches (@jimhester, #1134). ggplot2 now exports alpha() from the scales package (#1107), and arrow() and unit() from grid (#1225). This means you don't need attach scales/grid or do scales::/grid:: for these commonly used functions. aes_string() now only parses character inputs. This fixes bugs when using it with numbers and non default OutDec settings (#1045). annotation_custom() automatically adds a unique id to each grob name, making it easier to plot multiple grobs with the same name (e.g. grobs of ggplot2 graphics) in the same plot (#1256). borders() now accepts xlim and ylim arguments for specifying the geographical region of interest (@markpayneatwork, #1392). coord_cartesian() applies the same expansion factor to limits as for scales. You can suppress with expand = FALSE (#1207). coord_trans() now works when breaks are suppressed (#1422). cut_number() gives error message if the number of requested bins can be created because there are two few unique values (#1046). Character labels in facet_grid() are no longer (incorrectly) coerced into factors. This caused problems with custom label functions (#1070). facet_wrap() and facet_grid() now allow you to use non-standard variable names by surrounding them with backticks (#1067). facet_wrap() gains a dir argument to control the direction the panels are wrapped in. The default is "h" for horizontal. Use "v" for vertical layout (#1260). Intercept parameters can no longer be set to a function. They are all documented in one file, since they are so closely related. geom_bin2d() will now let you specify one dimension's breaks exactly, without touching the other dimension's default breaks at all (#1126). geom_crossbar() sets grouping correctly so you can display multiple crossbars on one plot. It also makes the default fatten argument a little bigger to make the middle line more obvious (#1125). geom_histogram() and geom_smooth() now only inform you about the default values once per layer, rather than once per panel (#1220). geom_pointrange() gains fatten argument so you can control the size of the point relative to the size of the line. geom_segment() annotations were not transforming with scales (@BrianDiggs, #859). geom_violin() now has the ability to draw quantile lines (@DanRuderman). ggsave() has been simplified a little to make it easier to maintain. It no longer checks that you're printing a ggplot2 object (so now also works with any grid grob) (#970), and always requires a filename. Parameter device now supports character argument to specify which supported device to use ('pdf', 'png', 'jpeg', etc. ), for when it cannot be correctly inferred from the file extension (for example when a temporary filename is supplied server side in shiny apps) (@sebkopf, #939). It no longer opens a graphics device if one isn't already open - this is annoying when you're running from a script (#1326). guide_colorbar() creates correct legend if only one color (@krlmlr, #943). guide_colorbar() no longer fails when the legend is empty - previously this often masked misspecifications elsewhere in the plot (#967). New layer_data() function extracts the data used for plotting for a given layer. It's mostly useful for testing. User supplied minor_breaks can now be supplied on the same scale as the data, and will be automatically transformed with by scale (#1385). You can now suppress the appearance of an axis/legend title (and the space that would allocated for it) with NULL in the scale_ function. To use the default lable, use waiver() (#1145). Position adjustments no longer warn about potentially varying ranges because the problem rarely occurs in practice and there are currently a lot of false positives since I don't understand exactly what FP criteria I should be testing. scale_fill_grey() now uses red for missing values. This matches scale_colour_grey() and makes it obvious where missing values lie. Override with na.value. scale_*_gradient2() defaults to using Lab colour space. scale_y_continuous() now also transforms the lower, middle and upper aesthetics used by geom_boxplot(): this only affects geom_boxplot(stat = "identity") (#1020). Legends no longer inherit aesthetics if inherit.aes is FALSE (#1267). lims() makes it easy to set the limits of any axis (#1138). labels = NULL now works with guide_legend() and guide_colorbar(). (#1175, #1183). Scales no longer round data points to improve performance of colour palettes. Instead the scales package now uses a much faster colour interpolation algorithm (#1022). scale_*_brewer() and scale_*_distiller() add new direction argument of scales::brewer_pal, making it easier to change the order of colours (@jiho, #1139). scale_x_date() now clips dates outside the limits in the same way as scale_x_continuous() (#1090). stat_bin() gains bins arguments, which denotes the number of bins. Now you can set bins=100 instead of binwidth=0.5. Note that breaks or binwidth will override it (@tmshn, #1158, #102). stat_boxplot() warns if a continuous variable is used for the x aesthetic without also supplying a group aesthetic (#992, @krlmlr). stat_summary_2d() and stat_bin_2d() now share exactly the same code for determining breaks from bins, binwidth, and origin. stat_summary_2d() and stat_bin_2d() now output in tile/raster compatible form instead of rect compatible form. stat_function() now always evaluates the function on the original scale. Previously it computed the function on transformed scales, giving incorrect values (@BrianDiggs, #1011).